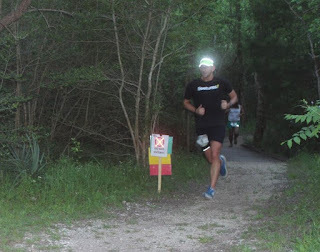 About a week before this race I was feeling excellent. 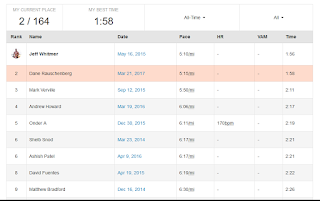 My training had been going solid lately and the format of this race suited me well. The San Felipe Shootout was a 5k, 10k, and half-marathon(ish) race all separated by just enough time to brush the sweat off before racing again. A 7:30 a.m. 5K was followed by an 8:30 a.m. 10K, followed by a 10:30 a.m. half-marathon. Excellent. Unfortunately, as the race drew close, I knew the weather was going to be a problem and was more or less doing all I could to prepare for that. Hot and sunny and humid were the forecast but that was basically the weather I have experienced every day since moving to Austin. What I didn't expect was a serious bout with lethargy in the week leading up to the race. As I am wont to do, when I want to do some fartlek workouts, I will search for some courses around my house in Austin. While where I live is very conducive to running on the Southern Walnut Creek Trail (one of the reasons I chose my home is this exact trail) it is a simple out and back without much variance. I don't mind this (I ran 3,000 miles around 1.5 mile loop of Liberty Park in Salt Lake City in the four years I lived there) but I like to explore by running. 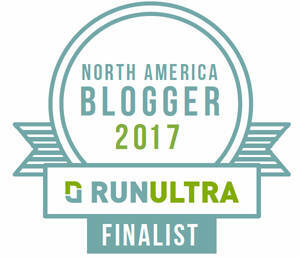 As such, I will look to see what some other runners have done on Strava, find some segments, and try to set the course record on them. reach, I could not best the owner of this one segment's course record. 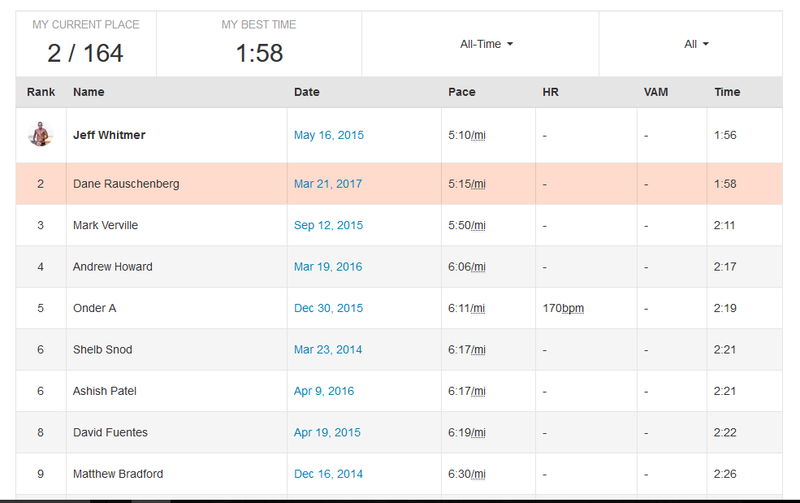 Yes, it was fast (5:10 pace) but over a short distance (.375 of a mile.) Yet, for some reason, I just couldn't seem to get enough wind in my lungs every time I tired it. I would fall two seconds short on three separate occasions. (I take some solace in the fact that no one else had come within 15 seconds on this segment.) While I tried to figure out why I couldn't turn on the jets, I heard everyone else talking about the pollen and their allergies. Prior to moving to Oregon I had never had a problem with my lungs in any capacity. Or, what is probably more accurate, I did but I just chalked it up to a bad day, or I was sick, or something else. Here I realized that apparently I was dealing with allergies. So I took a day off before the race and hoped running in a locale two hours away would help solve the problem. My bestie Shannon, coming back from a nasty ankle break last fall, and I both decided to take on this triple. I had hopes of placing in the top five and she wanted to do her longest run of the year. We got up at the ungoldy hour of 4 a.m. and were on the road at 5 a.m. for the two-hour trip down to the race. It was a relatively uneventful trek, and before long we were situated in the quaint Stephen F. Austin State Park. Temps were already in the 70s but there were some clouds in the sky and a nice breeze. We set up our chairs, laid out some changes of clothing, used the facilities, lubed up with Body Glide and took one last swig of cool liquid. It was time to race. Out of the gate, we ran out of the parking lot and almost immediately plunged into the trail. The 5K would be traversing one loop of what would later be the same course for the 10K and essentially the same course for the half-marathon but with two and four loops instead of one. The trail was very runnable, but hardly smooth or straight. 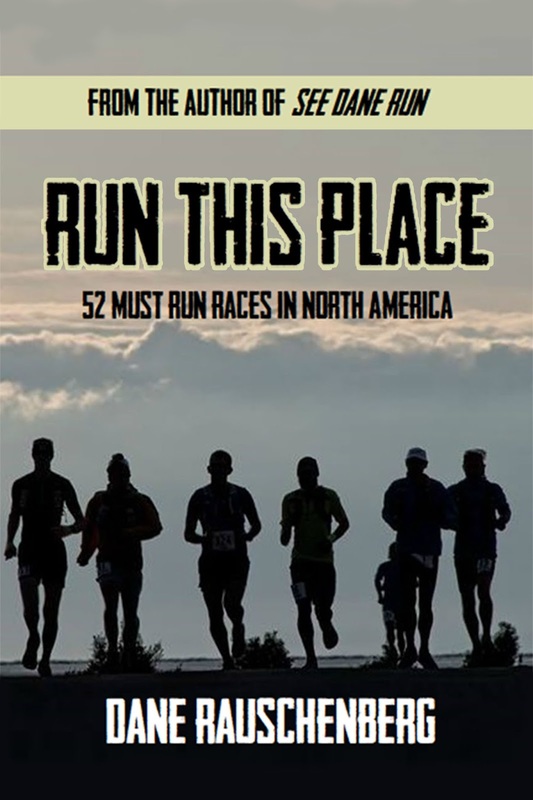 (Click here to see the course from my own race.) We ran counterclockwise, with two out and backs which allowed us to see many, but not all of the participants behind us. We were lucky this year to have dry footing as the previous two years had been mucky and "possessing of moats", respectively. 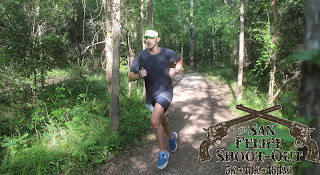 I started out about 6th or 7th knowing that a 5K is not my type of race, a trail is not my type of footing, and I did not know the course as many running already did. This effort was not about doing well in a sprint 5k but rather doing well overall in the combined races. 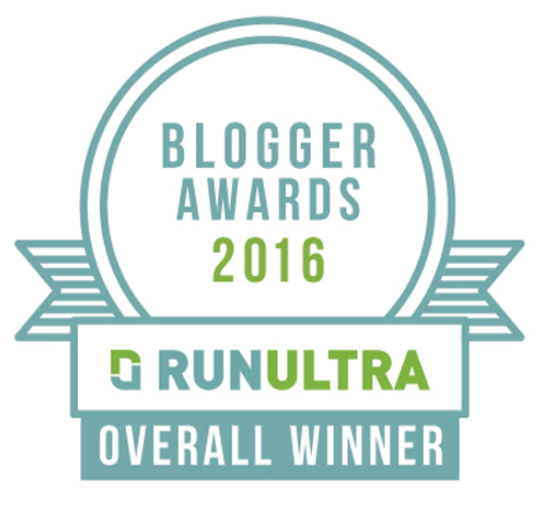 Unfortunately, even running relatively conservatively, I found myself unable to breathe. For the entirety of the 5k I was nearly clutching at my chest, waiting for the body to realize it was racing, and clear up the passages. It never happened. The only notable thing which happened during the 5K was one of those things that makes you tilt your head like a dog trying to understand its owner. At one point there was a turnaround in a small grass circle. 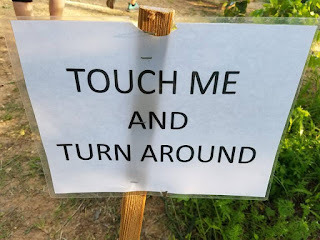 Every single person seemed to decide exactly where they specifically were going to turn around as the sign was not clear if you turned in front of it, behind it, or whatnot. Whatever you chose was a matter of feet and for the most part no one really cared. 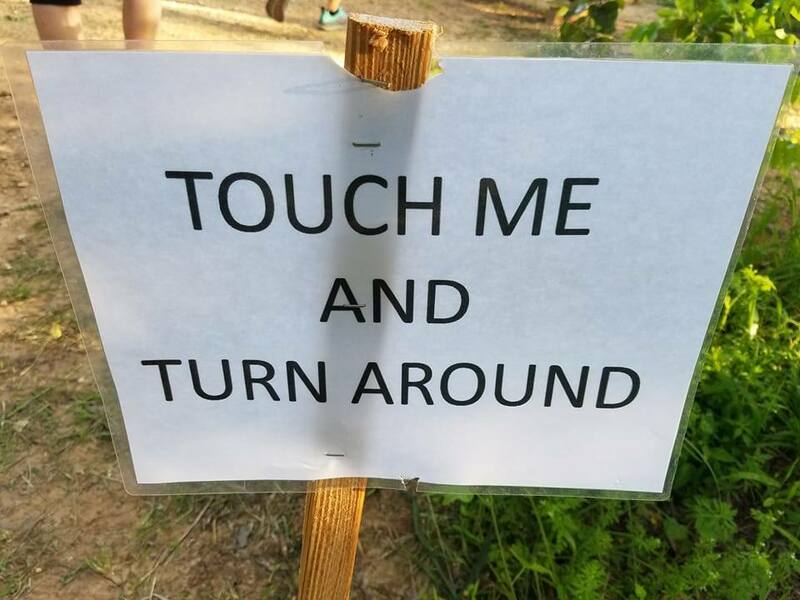 I have seen this in races many times, especially on a trail. But one ironclad rule of thumb is that you can't cut your route shorter than the person in front of you, especially if they are still making the turn. As I made my turn, I almost ran into the back of a runner who had been previously behind me but decided to cut the turn short. I thought it took some titanium balls to make such a brazen move and respected her chutzpah. Then I passed her 20 yards later and never saw her again. In spite of breathing through mud through a straw, I still came into the finish in 13th place overall. I peeled of my shirt and wrung out about three pounds of sweat. 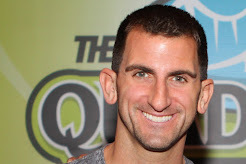 Rob Goyen, the RD and one heck of a guy (I will get to that in a minute) stared as the river of water poured out. I toweled off, put on a different shirt, drank a ton of fluids, and got ready for the 10K to start in 35 minutes. 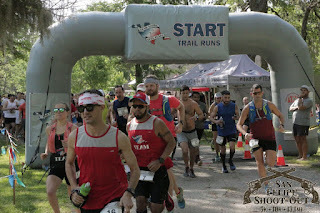 I had debated carrying my handheld Camelbak bottle for the 10K but figured that even though the only aid station was at the end of the loop, and you would have to go a few feet out of your way to get it, I would simply go without. took a big ole swig of water before the start of the race and got ready to rock. I figured I was now fully awake, had coughed out the crap in my lungs for the 5K, and would be ready to turn on the jets. Resigned to run out the loop, I just put my head down and trounced on. In this state of acquiescence I moved forward and was more than pleased to see the end of the loop in sight. 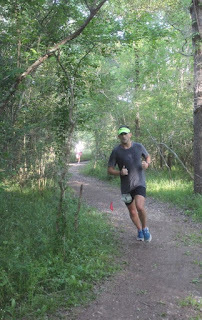 As I turned around the cone and headed out for the second loop, I was surprised that I wasn't all that much slower in this first 5K of the 10K then I was in the 5K itself. Time to get this over with. Suddenly, I went from 7:30 miles to 6:30s. Even if I didn't have the data to back it up, I had the runners who I passed to show the abrupt pick-up in speed. I had two last guys to try and reel in and was almost in their backpocket ready to make a move when I felt the slightest twinge of a cramp. Knowing I had 13.1 more miles to go, and sprinting here was pointless, I slowed a touch in the last quarter mile, still negative-splitting the second half of the race. My place was 17th overall which was hardly what I had wanted but far better than what it could have been if I had continued my lethargic slide. But then I sat down. For the next hour I fought with myself about whether I even wanted to run the half-marathon. The day was already not going where I had wanted it to go. As the heat continued to rise, I knew my chances of performing better were lessening greatly. When Shannon came in from her 10k, she told me she had never seen me look so utterly crestfallen before. She has seen me running 350 miles up the coast of Oregon and still apparently the look on my face was of utter defeat. I tried to figure out if I should go on. I finally decided that my original intention was to use this day of racing as a prep run for the Salt Flats 50K coming up in a month. If I was going to get a proper day of training in, it wasn't going to be by running 9.5 miles. So, I finally sucked it up and decided that yes, I would run but it would just be slow. No longer would I care about who I beat but instead today would be about smartly running the remaining miles. As we began the first loop, I hung tight to the right side of the trail letting anyone who wanted to pass me, do so. Not many did but I was obviously not closer to the front like I had been in previous races on the day. During this first loop, I can honestly say that I could not care less about finishing the half marathon. I can count on one hand the number of time in a race where I felt as abjectly disheartened as I did here. I know often it is something that is just in the mind and did my best to not think. Left, right, repeat. It didn't improve. While the whole loop is trail, there was one section that suited me better than any other. It was a completely flat, straight section with no twisting or turning and footing that was more or less as nice as you can hope for on a trail. Each time I hit this part I would pick up the pace and close gaps on runners. Once again I did the same in this race. 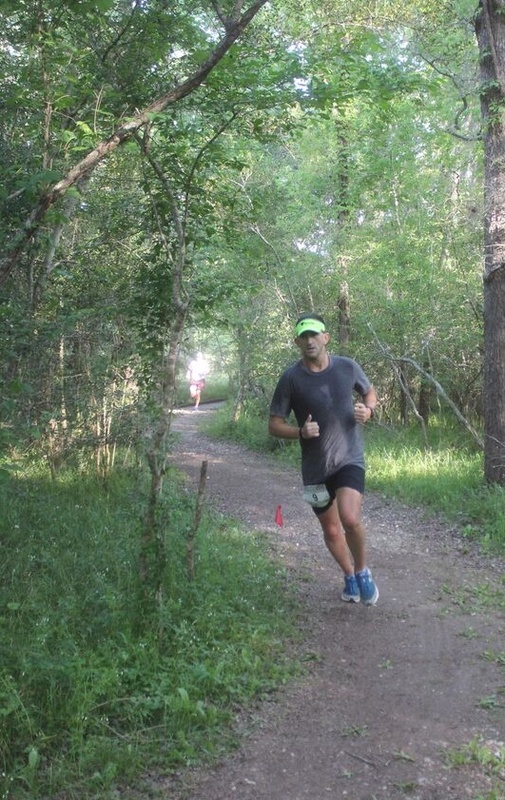 Closing in on the first loop, I passed a few runners and began feeling decent. As I started the next loop, I thought perhaps I would finish after all. This halfmarathon loop was marginally different than the other loops in order to make the distance as accurate as possible. There was a small dogleg section halfway through where we ran through the area that last year was in chest-deep water. I wondered if I would sacrifice the potential chafing for some cooling wetness but given how bad I chafe I knew that was not the case. As my pace picked up near the end of this second loop, I could see I was in the top ten of runners. However, on the straight stretch I mentioned above, I felt a slight twinge in my hamstrings. I knew at some point the dehydration and heat would have an effect but I wondered when that would be. It was obvious it was happening now. I approached the end of the loop and decided that while stopping short was hardly what I wanted to do, it was the wise move. I went through the end of the loop, stopped my watch and sat down. Drinking heavily from some ice cold beverages, I grabbed a towel and wiped myself dry. I continued to sit there for about ten minutes or so and then decided to go to the bathroom. To my surprise, there wasn't nearly the signs of dehydration that I would have expected. I drank a little bit more and dunked my head in an ice bucket. Talking to the Rob again, he told me there wasn't a darn thing wrong with stopping but I could take all the time in the world to finish if I wanted to. Then he again commented on the deluge of sweat which poured off of me. I figured I might as well give the rest of the race a shot. Out I went again on the third loop, after close to twenty minutes of downtime. To my surprise, my legs were not that cramped up or stiff. I began passing runners left and right and feeling far better than I had any right to do so. Obviously well behind where I should have been, the break, toweling and ice had obviously combated some of the worse effects of the heat and my own DNA (my endurance sapping liver is affected by Gilbert's Syndrome.) The loop went by rather uneventfully and I found myself back at the start. While I did not sit down for twenty minutes again, I did take another break, sat for a bit, toweled off again, and jammed a chunk of ice between my CamelBak and my back. Now with only three miles to go, I knew I would at least finish. My time was of no concern. Because of that knowledge, I spent the first .6 of a mile in a fast walk. I wanted to go faster but people in Hell want ice water. So I went with what I knew would work and that was measured forward motion. Finally, feeling well enough to run, I took off. As I passed some of the same people for like the third time in less time than it should take to pass someone three times (they had all passed me on one of my breaks) one guy in a huge sombrero asked "How many laps are you doing?!" I told him I decided to quit. Then decided I was bad at quitting and began again. He cheered me on and I gave him a thumbs up. line in 39th place overall and could not have been more happy to be done. I also was beyond proud of myself for not only persevering but doing so wisely. If I had put my health or the overall objective to prepare for this 50K in jeopardy, I would have stopped. But by running smart, I finished. All told, out of 107 people who finished the Triple race, I was 18th overall. Take out just the 20-minute break and I would have been in the top ten. However, without that break who knows if I would have even finished. Without a doubt the day did not turn out as planned. With running, pushing your body to perform, that happens. The bad days far outweigh the good days. You just hope the good days fall on race day. 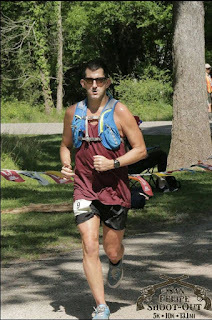 My Camelbak circuit worked perfectly and as always was the perfect pack for a shorter distance race (Even though I have used it to win two separate 50Ks.) I was trying out some new Feetures socks and in spite of the need to change pairs after the first two races because I am the Sweatatron 3000, they worked marvelously. Not a single hot spot or blister. I also lubed myself up quite liberally between each race with Body Glide. I cannot tell you how shocked I was that I didn't have a single abrasion after the race. I will often go for a leisurely ten miler and come back with (and I am not joking) 2nd degree burns from chafing if I forget my Body Glide. When I got home I expected to hit the shower and cringe a bit but not a thing. Hallelujah. I wore a lululemon singlet and short sleeve shirt for two of the races and lululemon shorts for all three of the races. They too worked very well, as I expected. As I have for half a decade now, I wore Julbo sunglasses and absolutely loved them. After the race I slipped my feet into some OOFOS sandals which, honestly, if you don't have pair, what are you doing to yourself?! The race itself was put together magnificently. The signage and markings were great. How people got off track is beyond me but as they say: don't worry too much about making something foolproof- they just make the fools better. 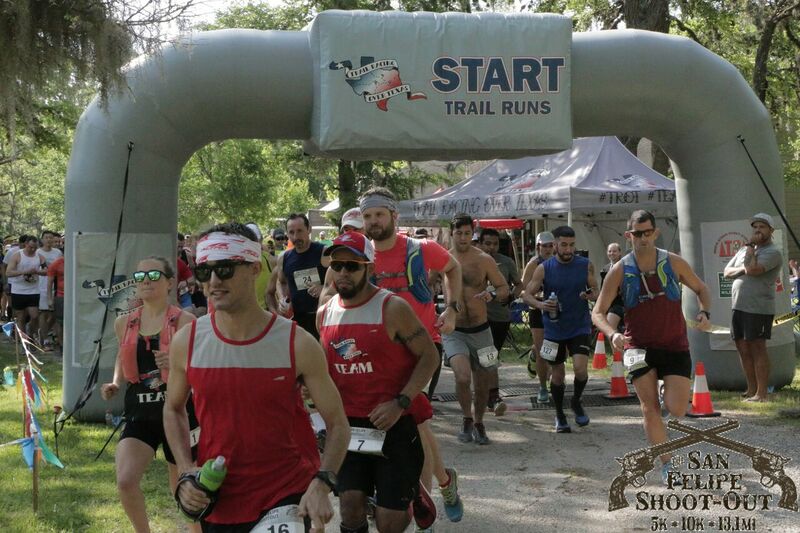 The volunteers were amazing and while they only had to man the one aid station at the beginning of the loop it was fully stocked with liquid and food at all times. The Race Director was still at the finish line greeting people who came in when I finally left sometime around 2:30 p.m. Lord knows what time his day actually started but to be on your feet even during the length of the race cheering every runner on is something special indeed. 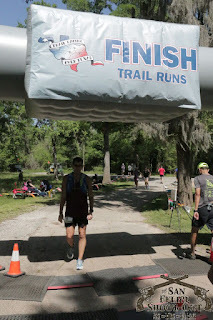 With a slew of races on his docket, I am sure I will find myself at the starting line of another Trail Racing Over Texas race. Hopefully in cooler weather and with working lungs.